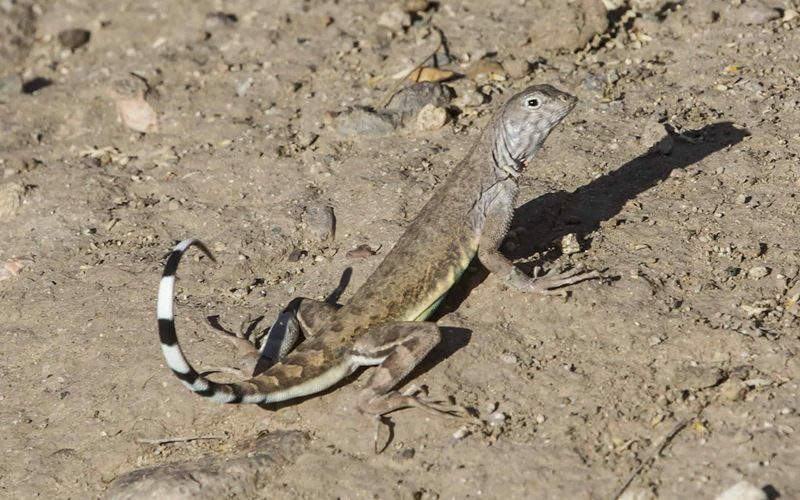 Zebra-tailed Lizards are very fast and can often be observed waving their banded tails. The photograph above shows a male Zebra-tailed Lizard. The lizard exhibits full breeding colors and were photographed in early May in Sabino Canyon. They have a pair of vertical black bars that are behind the front legs. This feature may not be as easy to see in the females and may not be evident in the immatures. Males have femoral pores but these can only be seen if the lizard is captured (a license is required for this). The Zebra-tailed Lizards are mostly found on the sandy areas of the bajada. Zebra-tailed Lizards are very fast and can often be observed waving their banded tails and then dashing away, teaching a predator that it cannot catch it so why bother trying. The Zebra-tailed Lizard lays 1-15 eggs in the summer. Hatchlings appear in the early fall. Once laid, the eggs are not defended and babies must fend for themselves. These reptiles eat insects, spiders and smaller lizards.